Visualization of large data sets requires advanced techniques in image processing and segmentation, hierarchical data management, and data reduction. 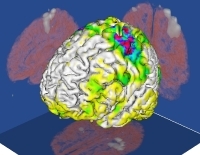 This covers a wide range, from classical medical imaging to simulation of natural phenomena. Data volumes generated by scientific simulations can easily grow into the range of gigabytes. In a functional neuroimaging experiment (PET, fMRI), a large number of data volumes is obtained, thus increasing data size even further. Both the increasing size and complexity of these data ask for new techniques for interactive visualization. The possibility of interaction during evaluation will significantly reduce the time required to interpret and present results. To arrive at interactive visualization and analysis for large data sets, many techniques are available, such as auxiliary data structures; special (multiresolution) data transforms, e.g., wavelets or multiscale morphological methods; extraction of features from the volume data and visualizing the features only. In such interactive data visualization, the speed of the data processing stage should be comparable to that of the visualization step. We address this demand by developing efficient algorithms and/or by mapping the involved computations to programmable Graphics Processing Units (GPUs), which are capable of outperforming CPUs for compute-intensive applications. Another important aspect is the determination and visualization of uncertainty in three- and higher dimensional data. For details on these and other projects please look at the links on the bar on the left.